The New Zealand Red Ensign, with four white stars, became in 1901 the correct flag for New Zealand merchant vessels. The statute also allows the Red Ensign to be used on land on occasions of Maori significance, continuing the long preference of Maori for the use of red in flags. In 1887 the British Board of Trade set up a committee to revise the International Code of Signals. Details of the revised code, due to come into use on 1st January 1901, were published in 1898. It continued the existing practice that, "A ship wishing to make a signal hoists her ensign with the code flag under." A new ensign was introduced to identify British colonial merchant ships, a white circle in the fly of the Red Ensign, with the badge of the colony inside the circle. The Nautical Adviser to the New Zealand Marine Department recommended that four red stars should be set in the circle on the Red Ensign, and a similar badge used on the Blue Ensign. The New Zealand Government agreed to this, and a request for approval of the ensigns was forwarded to London on 5th July 1898 by the Governor, the Earl of Ranfurly. The ensigns were authorised by an Admiralty Warrant dated 7th February 1899, announced in the New Zealand Gazette on 23rd November 1899, and came into use on 1st January 1900. The New Zealand Red Ensign had not been changed by the 1902 Act, but in the following year, the Shipping and Seamen Act, Part XIV, (No.96) section 341, replaced the white disc in the fly of the Red Ensign, with four five-pointed white stars. "The ensign shall comply with the description of the New Zealand Ensign, as set out in the notice by the Minister of Marine published in the Gazette on the 24th day of June 1902..., save that the lower canton of the hoist and the fly thereof shall be white and the Southern Cross on the fly shall be represented by red stars as in the New Zealand ensign increased by the width of the white borders to the stars in that ensign." While this description only applies to the white ensign, it is suspected that the same description of the stars also applies to the red ensign. - it is preferred by Maori (and already permitted for use on land by them). The New Zealand White Ensign was also proposed by Peter William Dean from Otago as the new national flag. The motivation behind the proposal was to keep the existing flag design but make it more specific for New Zealand - in particular, to make it more different from the national flag of Australia and to allude to "the land of the long white cloud". On 12.06.1902 this was promulgated as being the national flag «for general use ashore and government vessels» (afloat). Click here to see a photo image of this flag. This ensign consists of a Royal Blue flag proportioned 1:2. The New Zealand National Ensign appears in the canton. In the fly of the flag is the New Zealand Police Seal coloured silver-gray. The seal consists of the Queen�s Crown surmounting three inter linked letters ("NZP" for New Zealand Police). The letters are surrounded by two silver ferns. This flag is flown outside all police stations in New Zealand. It flies beneath the New Zealand Blue Ensign on National Holidays, and is draped upon the caskets of Police Officers killed in the line of duty. 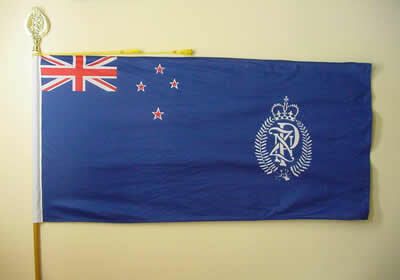 The NZ Water Police use the Police Ensign on unit vessels, and the ensign is also seen flying along side the national flag at major police stations. With respect to the Police and Fire Service ensigns, the illustrations are accurate (I go past examples of both every day), but I recall that in the 70s and 80s there used to be a white fimbriation around the NZ Flag in the canton. Presumably a decision has since been made to remove it, maybe for production cost reasons(?). The Fire Service Ensign is used at major Fire Service stations.